Mata Vaishno Devi Temple - travel guide and personal experience of journey. Are you planning for a trip to Vaishno Devi temple? Mata Vaishno devi temple is is situated in the state of Jammu & Kashmir and it is a holy place of Hindu Religion. In this article, I am going to share my personal experience with you and hope it will help in planning your visit to this holy place. Mata Vaishno Devi temple is situated in Trikuta hills of Himalaya in Jammu & Kashmir. The nearest town in the foot hills is Katra and fall under the Reasi district of Jammu and Kashmir State. The holy temple of Mata Vaishno Devi is situated approximate 10 kms from the Bus Stand / Railway Station of Katra. Helicopter service also available from Katra to Sanjhi Chhat which is approximate 2 Kms far away from temple. Please note that Helicopter service is available only in the clear weather. We travelled by Ahmedabad - Jammu Express train from Jalandhar City. Train left Jalandhar at 10:30 am and reached Katra at about 06:00 am. We stayed in hotel to take a bath and then visited the Yatra Parchi (Yatra Slip) counter to take the slips to start yatra (on foot). We can get yatra parchi online in advance and free of cost at the website of trust of Mata Vaishno Devi. After breakfast, we started our journey on foot. We took a bath at Banganga checkpoint and continued walking. There are horse service available, Pithu (men pick the kids / old men on back) and Waggies (for disabled / old persons who can not walk). We reached the temple at about 5:00 pm. 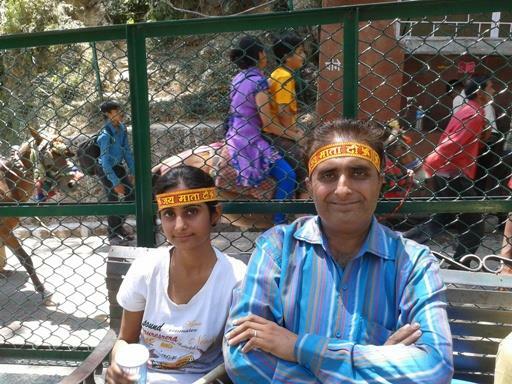 Took a bath in the temple and stood in a line to worship Mata Vaishno Devi. It was pretty crowded and we had to stand in line for more than hour to reach the worship place. We spent about two hours walking around, praying and enjoying the place. 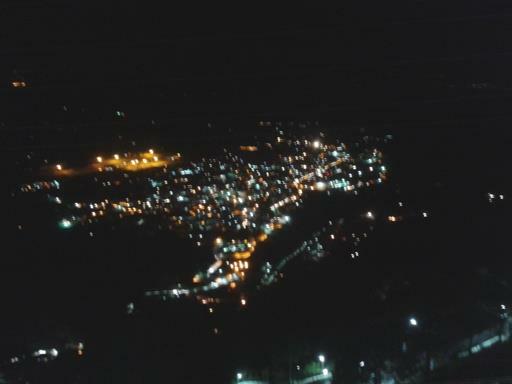 Then started back walking journey at 2:00 am and reached Katra at 7:00 am in morning. Then we took some breakfast and reached Jalandhar by Bus. Altogether, it was a pleasant trip, rejuvenating mind and body. We were tired after the several hours of travel and walking but the kind of relaxation and peace of mind we experienced after this pilgrimage was tremendous. You can reach this place by air, train, bus and car. The airport is not so close, though. Nearest Airport is Jammu, which is approximate 55 kms from Katra and Katra is the base camp point to start journey. Jammu is well connected with rails from all over the country and now Indian Railways has started some direct trains to Katra named Ahmedabad - Katra Express, SVDK - New Delhi A/c train and three daily local trains from Jammu - Katra - Jammu. Also Katra is well connected by Road. We can take bus service from Railway Station of Jammu to Katra. There are plenty of taxi services as well. There are hundred of budget hotels in Jammu and Katra. You will find hotels in all price ranges, starting from budget hotels to expensive luxury accommodation. If you are on a tight budget, there are dharamshalas are also available. We can get single room in just Rs. 500-600/- if you have good negotiation skills. There are so many food joints available in Katra, Jammu as well as near the temple. If you are looking for a lot of choices, then better you fill your stomach from Jammu or Katra. You will get light, simple food near the temples. Since you have a long way to walk, it is better to eat light food and also avoid carrying lot of food to reduce the weight you need to carry. Have you ever visited Mata Vaishno Devi Temple in the Himalayas? Share your travel experience. Good blog about the Mata Vaishno Devi temple. Thanks for the information. This personal experience will serve as a travel guide to the visitors. Nice Blog.Thanks for sharing this type of blog. Travelhousedelhi is in the travel business since long and we value the trust that our customers and provide best online bus booking services and Vaishno Devi Package by Volvo From Delhi. Thank you for your informative post on Mata Vaishno Devi Yatra, the trip to the famous temple Mata Vaishno Devi Temple situated in the state of Jammu & Kashmir. A visit to the auspicious Vaishno Devi temple along with your entire family is considered to be a once-in-a-lifetime opportunity. There are many people who try to plan a family-visit to Vaishno Devi for many years, but nothing works out for them. MR Holiday offers Vaishno Devi tour package where everything is already planned and arranged for your family, thereby giving you the perfect opportunity to visit Mata Vaishno Devi temple. Hey, I have a question. 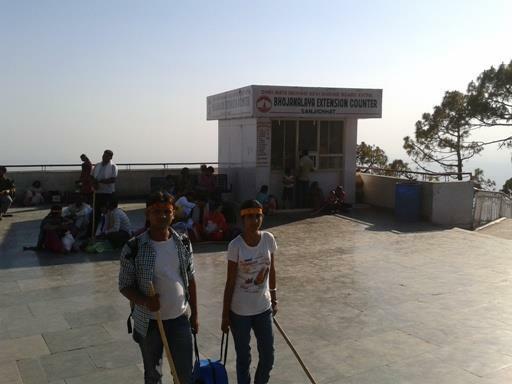 Can we take a mobile phone, camera and binoculars at Vaishno Devi yatra or not? Best time to visit the temple is missing.